From gelato to gourmet garage… next stop was an incredible kitchen store that would rival a sur la table or williams sonoma. It was fabulous. If we weren’t schlepping by train to Seattle a couple of days later, I could have filled several balikbayan boxes with goodies from this store. I restrained myself and only purchased a traditional basket for proofing round loaves of bread, while everyone got to know each other better and prepared ourselves for dinner. After gourmet garage, we got into Jeffrey’s van and the group kindly drove us to Stanley Park where we stopped for some photos, took in the magnificicent, water, bridge and mountain views, and basically just had a leisurely paseo as one might do with family or friends back in the Philippines. It was a strangely familiar and very comforting experience, and suddenly strangers seemed like long lost friends. Was this the power of a common interest in food? It was heartwarming. Next stop, the West End, for dinner at Killer Seafood and Pizza, a place owned by a friend of bettyq, on Robson Street, for our dinner. 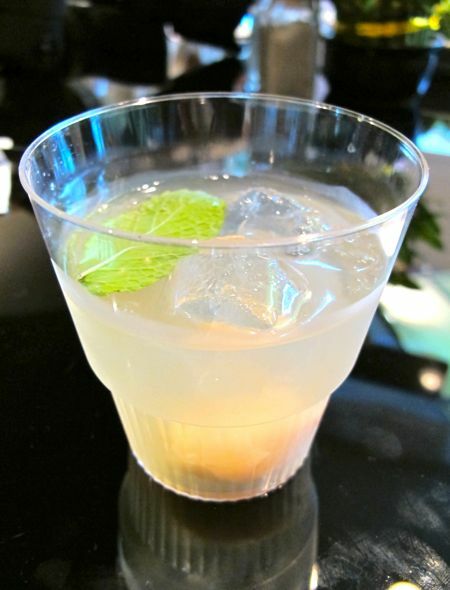 Other guests arrived and introductions were made over a coctail with lychee fruit. Zoilo, Poch, Cal, Farida (who drove all the way from across the border in Washington state! ), Jane, Angelo, cwid (Nori) and Chris joined us for dinner. I am certain I have missed a few names, help Jeffrey and bettyq if I have left anyone out! It was interesting to hear everyone’s stories, how long they had called Canada home, what news there was from back home, etc. So Canadian, and yet so Pinoy at the same time. And everyone seemed to get on rather well, despite some of them never having met each other before! 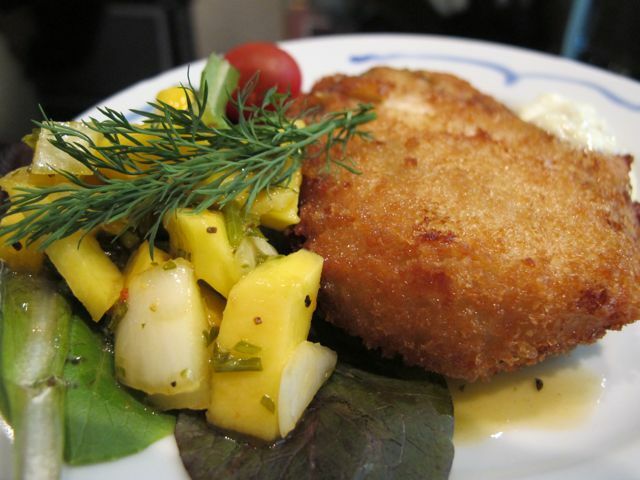 Salmon cakes served with a mango salsa. 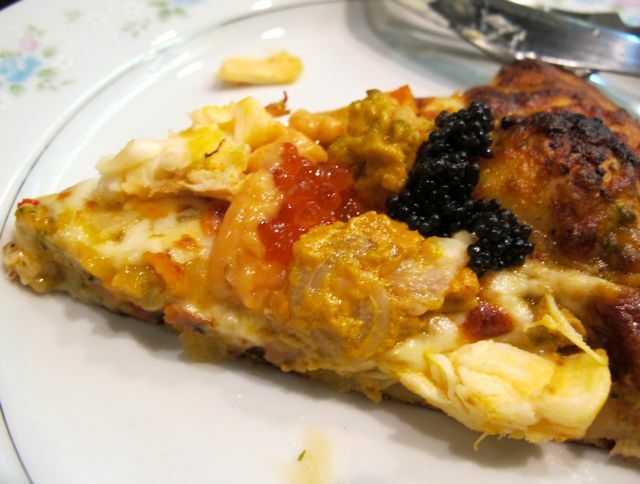 A fabulously opulent slice of pizza with with lobster, salmon roe and black caviar. Wow! 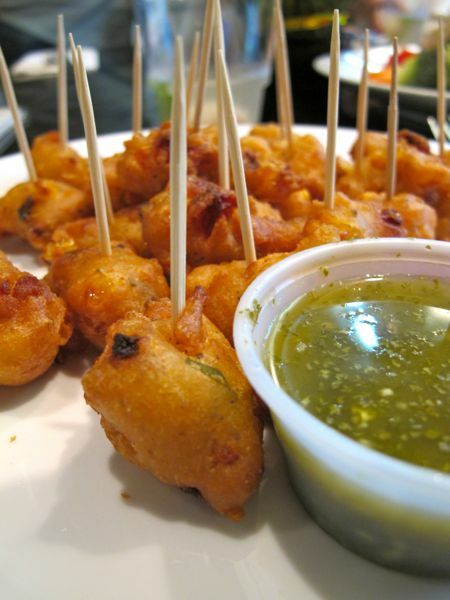 Unusual and delicious! 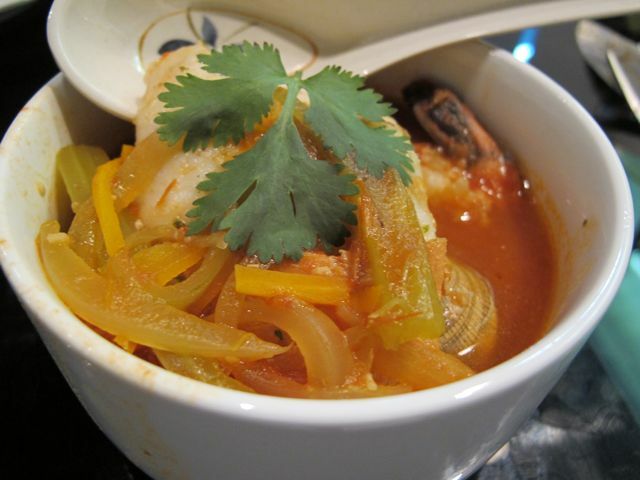 A seafood soup, almost a bouillabaise chockfull with prawns, scallops and fish. Delicious. By now you can all tell this wasn’t your typical neighborhood pizza parlor. It’s owned by a chef who is intent on misleading passersby with the disarming name “Killer Seafood and Pizza” and this is the stuff that emerges from the kitchen! Killer indeed! 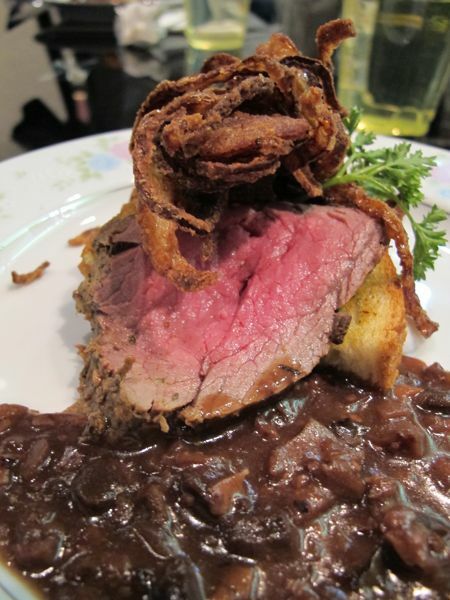 …while I must say the food was wonderful, I think the dishes were eclipsed by the guests. It was an evening of conversation, laughter and conviviality normally reserved for a bunch of long time friends, relaxed and at home in each others company. Some readers laughed that I sounded like I wrote, when experienced live… hahaha. And I could put faces to commenters, which is always a nice thing to do. Not a shred of negativity, but perhaps some regret of all the missed opportunities for the Philippines who seemed to have such good prospects, but had mismanaged itself into its current state. 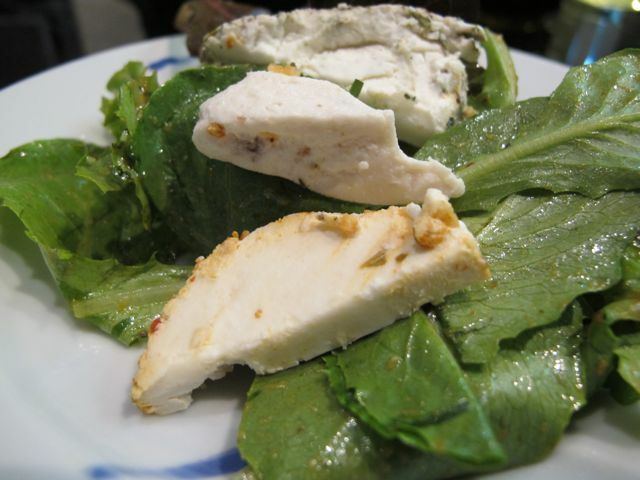 A small salad of romaine leaves with several shards of local cheese. It was heavier than it looks, but a nice way to segue into the sweets that bettyq was busily plating herself in the restaurant’s kitchen. 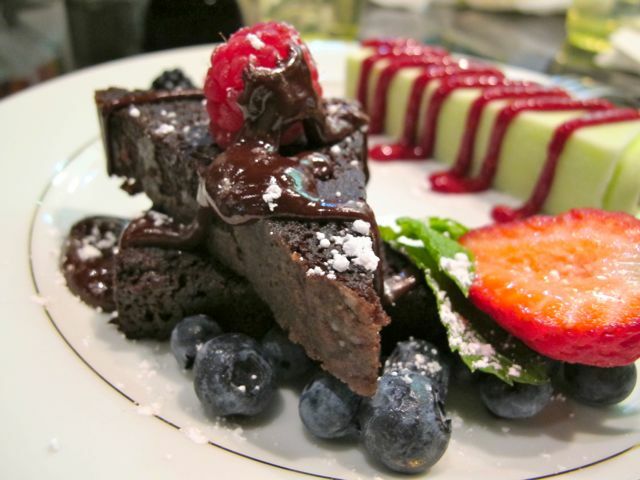 What emerged from the kitchens was a veritable work of art, a pie slice piece of rich melt in your mouth chocolate cake, served garnished with blueberries, strawberries and raspberries, and sprinkled with powdered sugar. A homemade popsicle with a raspberry sauce or coulis. Yipes, I ate it all!!! Fabulous, bettyq! oh, hello Canada readers! bettyq, a face to the name, finally! nice to see all of you! am sure no one could tell that most the members of your party were meeting each other for the first time that night. Hi Bettyq good to finally see you. Got my guess right as to who you were from MM’s previous pics and post on the Vancouver eyeball. I am such a fan of yours. I have a folder full of your recipes that I have saved from this blog and from other blogs where you have commented. This is nice. Great food and great company. See you all soon in Zubuchon! Great pics! And great food! Killer Seafood & Pizza will be on our list of restaurants to try when we go back. Just curious, is the chocolate cake served THE chocolate cake of bettyq which is in the recipe index here? If it is, I’m excited to try it even if hubby stays away from sweets!!!!! hi Bettyq! Did you make the candied salmon yourself? May I request for a recipe? When I was working in Vancouver years ago my chef made a candied salmon spread for some appetizer (a roulade of sorts) and it was addicting! Thank you! 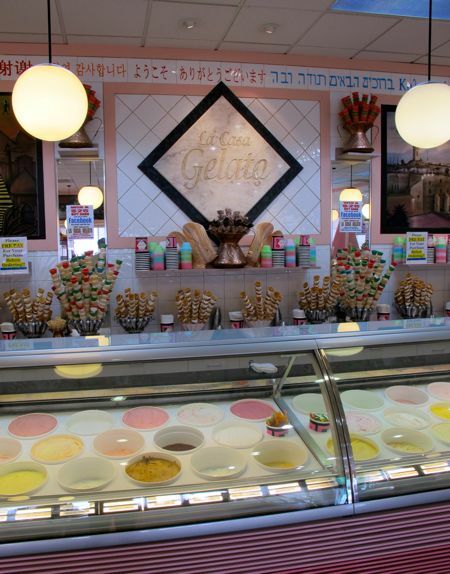 210+ flavors of gelato? I had to read that line twice, I can die and go to gelato heaven there. I’ll go to Cebu next year, I’m keeping my fingers crossed that I’ll see you there! yehey!! i finally got to place faces with names i see so often on this blog! what a wonderful and unique experience! Nice to meet you Bettyq…. MM, Zubuchon is in my list of go to places on our vacation next yr….hindi puedeng palagpasin namin yan. Hope you will be there visiting when we stop by! As for the next eyeball…. NEW YORK???? Mr. Roland…I THANK YOU for sharing as well! I cannot imagine nor comprehend how people can be so cruel and use someone’s loss as a means to retaliate….even if brought on as a joke?!? It is indeed an unacceptable joke! BUt I applaud you for how you handled him! I’m so bummed that I couldn’t make it to the eyeball. But the photo mural that kept me away is now printed and up on my client’s wall. Am looking forward to meeting folks at the Emperor’s soiree in Dec.! What a heartwarming post. The sated smiles on your faces say it all. I bet there’s lots of us waving at our computer screen to betty q! 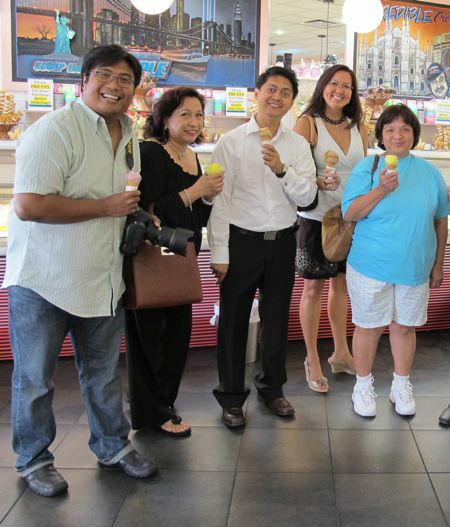 Pictures say it all, of how a great food blog, generous blogger and viewers can bring people together. I have to say that the MM Vancouver eyeball is one of the highlights of my 2011. It was indeed our privilege and pleasure to meet you and the Mrs. You are accurate to say that it was as if we all had known each other for awhile – – – and that’s because Food ( and your beautiful prose) was our common ground. You will be pleased to know that from this eyeball has spun-off a mini MM foodie group here at YVR. A few of us including the esteemed Betty Q have been getting together either for coffee or trying out new places to eat. We have also been blessed to be on the receiving end of Betty Q’s generosity and kindness in the flesh! We have sampled her ensaymada; suman with ube and langka and we know that there will be more to come. In fact, we will be having our MM (YVR chapter) Christmas soiree next month. MM, your blog doesn’t only nourish and nurture our passion for food; it’s also paving the way for beautiful friendships to develop and thrive- – – and for that we will always be grateful. wow!!!! 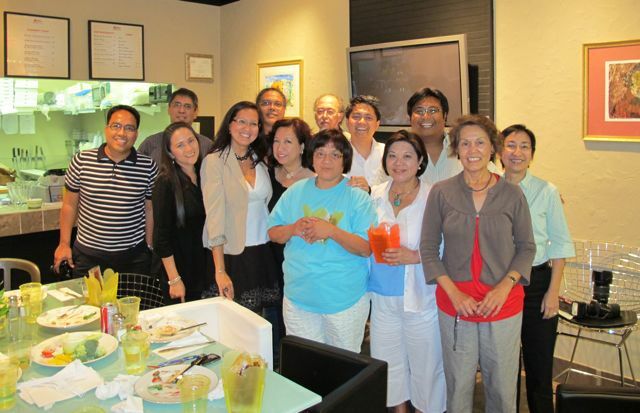 Thanks for this post…how can you not have a great time with all that food and company..??? I’m with you New York Eyeball!!! 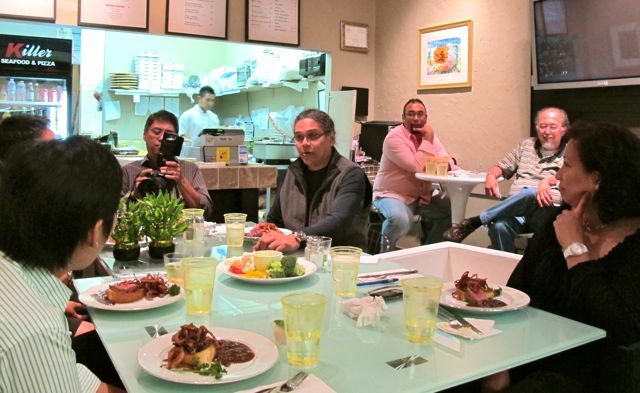 As usual, the food looked great and am sure was yummy as well with all the foodies around! Bettyq, pls share your chocolate cake recipe–looks divine! Waaa….I envy you guys for meeting the bettyq in person. You are as I imagined you bettyq! Such fun to be brought together by a common interest. Applause. for you MM and Mrs Mm!!! thanks for this post MM! as ros-anna mentioned above, the get-together continues for us here in Vancouver! You are most welcome to join us in our Christmas soiree! MM and Mrs. MM, we sure were blessed with your presence. Got to meet all the nice people who frequent your blog. Alas, I won’t be able to join them for the Christmas soiree. Had another commitment I could not undo. Also, Mrs. MM, did not mean to cover you up. ‘scuse me. Nakahiya. @bettyq, tried baking ensaymada! but the dough was slow to rise. I thought the yeast was no good so did another batch. I ended up with two and they are in the freezer. I remembered you said you place them in the freezer and you just get a piece at a time. That is what I did and it is working fine. Thank you for the great tip. Still don’t know how to coil them nicely. Ros-Anna, your comment left me teary eyed! I agree with your sentiments. MM, his family and followers really feel like family. I host Fridays meals for a few ladies/girls working for Arab and expat families in my building (they have Fridays off). Our Friday rituals include: eating pork (using recipes we find here), taking turns reading aloud MM’s entries and the comments, of course. The girls, mostly treated not too well by the bosses, look forward to Fridays mostly for the MM reading time! I use the reading time to teach them to speak English better as I think they’ll be better off (able to ‘defend’ themselves if need be) if they can articulate themselves well. So for that, I truly am grateful for MM and his followers as they make the lives of some people on this side of the world a bit bearable. That dessert plate looks too delicious!! Droooolll! @MP: MM reading (aloud) sessions, that’s so cool! More power!